Welcome to Make It Monday with Kraft Outlet. Use this week's "Winter Blues" theme to inspire you to create your project and then link it up at the bottom of this post before 6:00 p.m. (Central Time) on Sunday October 13, 2013. Remember your projects MUST include the use of Kraft cardstock and/or items that can be purchased at Kraft Outlet! Also, all of our followers who participant in our challenges this month have a chance to be featured on our "Feature Me Fridays" posts as well as be entered to win a $15.00 Kraft Outlet Store Voucher! Please limit your weekly challenge entries to your TWO best creations and thank you for your participation! When Karen Letchworth thinks of "Winter Blues", the water coloring technique comes to mind for some reason. So, Karen grabbed a Canvas Tag and used simple water colors to paint it blue. She did the very same thing with a length of Twill Tape; as both of these materials grab the water color quite nicely. The Canvas Tag almost looks denim after painted. Next, Karen embellished her tag using some stamps, glitter, seam binding, a button, Baker's Twine, and two felt snowflakes that are attached to a Round Metal Edge Grungy Prim Tag. It's a very simple project, but gives a great "Winter Blues" effect. 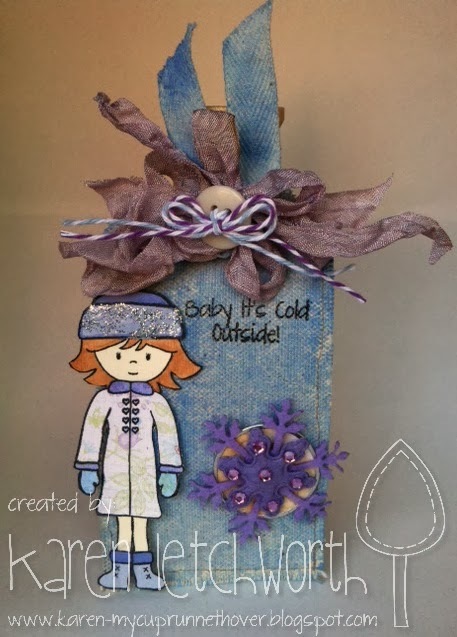 For more details about the products used on this little "Winter Blues" tag, please stop by Karen's Blog, My Cup Runneth Over to say hello. Have fun creating your project this week! 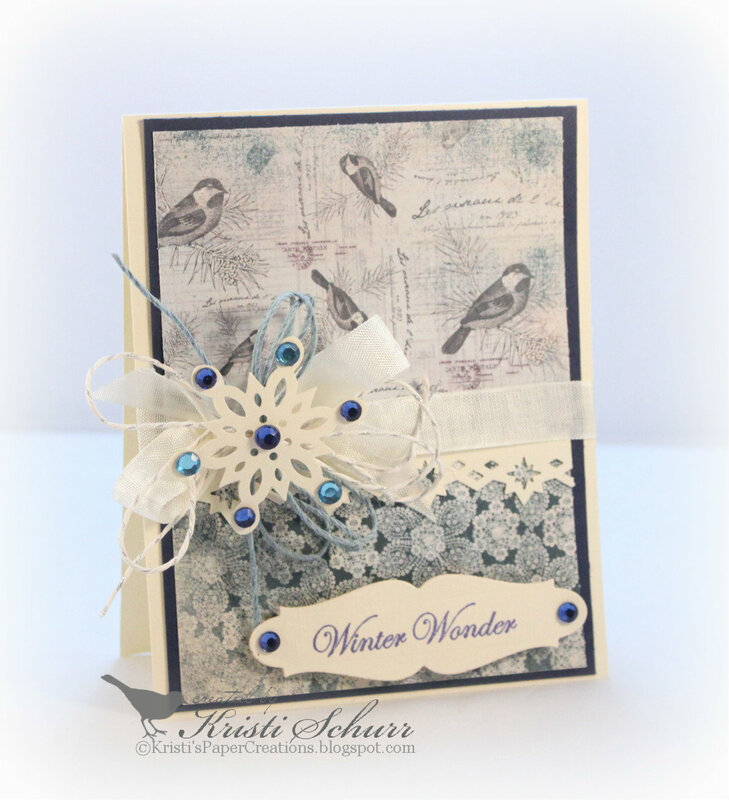 Kristi's card for this week's winter blues challenge features some of her favorite things, birds and snowflakes! She began her card with a base made from Buff Ivory Cover Weight Card Stock. She layered on a dark blue panel and then two patterned patterned papers that were joined in the middle with a star punched border piece made from Buff Ivory Card Stock. Kristi then used some cream seam binding and tied a bow around the middle of her card, securing it to the left side. She then used some blue cording from the Pastel Hemp Cord pack and some cream and silver twine from the Metallic Twist Hemp Cord Pack to form two more looped bows and adhered them to the cream seam binding bow. After punching out a snowflake from Buff Ivory Card Stock,she decorated with light and dark blue jewels and adhered it to the center of the bow. She then stamped the sentiment on a die cut tag made from more Buff Ivory Card Stock,added two blue jewels to the sides and adhere it with foam dots. For more information and a complete supply list, please visit Kristi at her blog, Kristi's Paper Creations. For this week's "Winter Blues" challenge, Tammy started by creating her focal image using the emboss resist technique. This allowed her to use distress inks to create her blue background. Next she matted the focal image using a coordinated die-cut. Tammy took a scrap piece of white cardstock and stamped a tiny heart backgrond in the blue distress ink and punched out two hearts and layered them in the center of the wreath. To build her card, she started with a card base of Brown Kraft Cover Weight cardstock onto which she pieced together her patterned papers. She cut two banners and layered them on the right side of the card front. Her sentiment was made from Seasonal Chit Chat Word Stickers. A length of crochet trim was added to the top of the card. She then moved to the bottom of the card and took pinking shears and trimmed a piece of white cardstock to give another decorative touch. Next she wrapped the card front vertically with a length of White Twill Tape and tied off in a bow where she then created an additional multi-loop bow from Metallic Twist Hemp Cord embellished with a Custom Fastener. Please visit Tammy's blog: Creating Somewhere Under The Sun for a complete supply list and additional pictures.